Schumer said about 100 jobs are at stake at American Classic Outfitters' factory, where more than half the uniforms worn by Kobe Bryant, LeBron James and other NBA players are manufactured. Sen. Chuck Schumer doesn't want NBA players taking to the court wearing jerseys made in Asia. "Basketball is an American game," he said at a press conference outside of the outside the NBA Store on Fifth Avenue Sunday, where he urged the league to intervene and stop Adidas from moving production of the NBA's official uniforms to Thailand, or pull out of its contract with the sports apparel giant. "Adidas' plan is to outsource the jerseys to Thailand and with that, they threw an airball big time," Schumer said. Saying Adidas has broken its contract with an upstate New York company that poured $1 million into the facility, Schumer called on the NBA to end its deal with the jersey maker if it goes ahead with the move from Perry, N.Y.
"Because it's an American sport invented in America, played better in America than anywhere else, the jerseys ought to be made here in America," Schumer said. 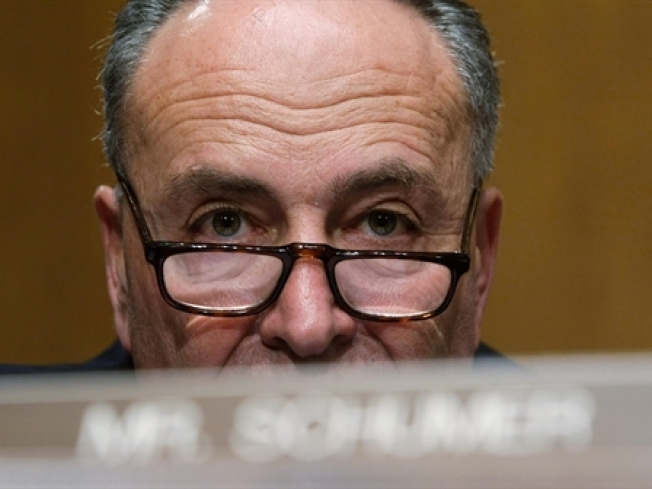 "The bottom line is that this outsourcing has gone too far," Schumer said. Disappointed by the response he got from Adidas, Schumer said he spoke Saturday over the phone with NBA commissioner David Stern. "He said he'd look into it and work with us. He seemed sympathetic, he's a man of his word and I think the league understands how unfair this outsourcing is," Schumer said. "So we hope that the NBA will talk to Adidas, get them to change their way, keep the jerseys made here in America, keep the people of Perry employed." The NBA released a statement after the press conference offering to facilitate a meeting between Schumer and Adidas, which it called "the most significant user of U.S. facilities to manufacture sports league apparel." "The NBA conducts business with more than 200 apparel and consumer products companies in over 210 countries and territories and we do not mandate where they manufacture their products," the statement said. "We do, however, have a strict Code of Conduct that mandates the factory conditions under which Adidas and all our licensees must manufacture NBA goods." Last week, Schumer called on Adidas to reverse its decision and continue making the uniforms in the U.S. The senator said he's turning his attention to urging the NBA to intercede after getting a lukewarm response from Germany-based Adidas. Adidas has said its decision to shift production to Thailand was "in line" with the company's strategy of moving production closer to "the source of uniform materials." The company said that it produces uniforms for teams at more than 30 facilities in North America and "will continue to do so." The league has contracts with two other U.S. companies to make the official NBA jerseys.